The Plymouth Belmont was both First Plastic Bodied Plymouth and the First Factory Plymouth with a V8. Plymouth would introduce their first V8 in 1955, as it was well known that Chevrolet would be releasing theirs in 1955. 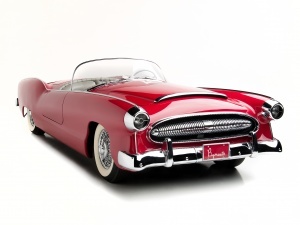 The convertible Belmont and the also plastic bodied 1954 Desoto Adventurer were created for the 1954 Chicago Auto Show, as answer to the Chevrolet Corvette sports car released the year prior. Also developed by The Chrysler Corporation’s Advanced Styling Studio were the Plymouth Explorer and 1953 Dodge Storm Z-250. In 1932, A 23-year-old Virgil Exner was hired by GM's Art and Color Studio. 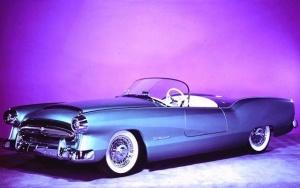 Boss, Harley Earl immediately recognized Exner's design talent. Two years later Enxer was put in charge of the entire Pontiac Studio, a job he kept until 1939 when Raymond Lowry hired him to work on his studio's design contract with Studebaker. Exner worked with Lowry and Studebaker all through WWII, and when the highly advanced 47 Studebaker's were shown to the public in 1946, they were touted as "The First By Far With A Post War Car. It would be the 1949 Model year when the "Big Three" would catch up. A dispute between Lowry and Exner over credit for the design of the 52 Studebaker caused Exner's firing. Studebaker wasnt impressed with the Lowry proposal for the 52s, and Exner showed them a design he'd been working on at home on his own time. Studebaker liked it and Lowry wanted credit for his employee's work. He was fired when he refused, but Studebaker picked Exner up for their in-house design team. There was little love between Lowry and Exner for the rest of each of their lives. In 1949, Chrysler President K. T. Keller hired Exner away from Studebaker for the purpose of designing cars that would improve Chrysler's stodgy image. The Chrysler Corporation was well known for its engineering firsts, but not its styling. The Chrysler Corporation's "Small on the Outside - Big on the Inside" designs looked ancient when compared to the 49 Ford and GM offerings. Keller wanted the cars designed to where a man could drive with his hat on. This made the cars appear too tall. At first Exner worked secretly on Advance Designs, but was soon promoted to head the studio. 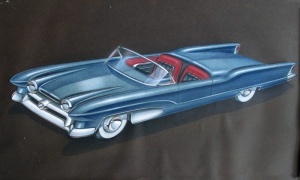 The model year designs were already locked in through 1954, so Exner began work on the 1955 model, the first year of the "Forward Look" designs. 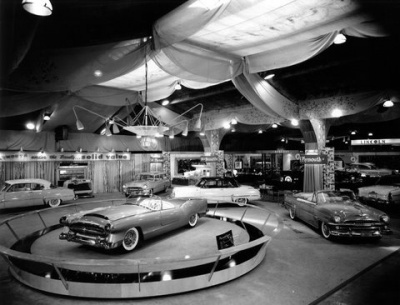 Keller and Exner agreed that they should step up Chrysler's showing of Dream Cars to compete with Harley Earl's million dollar dream cars displayed in the Motorama shows. They felt this would create excitement with the public on updated designs that would hit the showrooms in the future. However, they would have to do it on a budget no where near the size GM had given Earl. The body was designed by Bill Robinson from Briggs Manufacturing under the direction of the Virgil Exner led Advanced Styling Studio. The overall length is 192.5” and the height a very low 32” at the top of door or 49” at top of Plexiglas windshield. While most of Chrysler’s Show car bodies of the period were contracted to Giha, Chrysler had recently purchased Briggs Manufacturing, because of their fiberglass expertise, and gave them the project. Bill Robinson later told a reporter that Chrysler President K. T. Keller had intended the Belmont into Production, with Briggs building the bodies. That obviously never came to happen. Chrysler dropped the thought of competition to the Corvette in 1955, most likely due to the poor Corvette sales in 1953 & 1954. The car was painted a silvery light blue (Azure Blue) and had no exterior door handles – making it to where doors had to be opened by reaching inside. 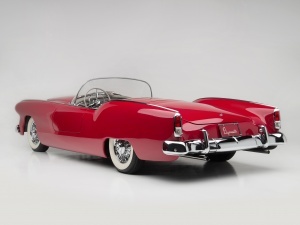 The taillights were taken from the 1953 Chrysler parts bin, as were the Kelsey Hayes wheels. The headlights were recessed into chrome buckets. Chrysler had recently begun the “Turbine Project”, and styling cues used some from that conceptual direction. The interior had wide bucket seats in light grey, and the radio was located between them. The soft top roof was hidden behind the seats. 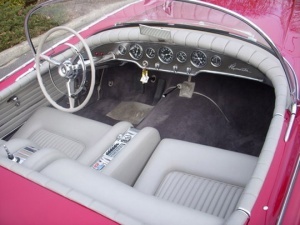 The steering wheel was stock Plymouth for 1954. The engine a Dodge 242ci Polyspherical producing 157hp (serial number P27-1014). 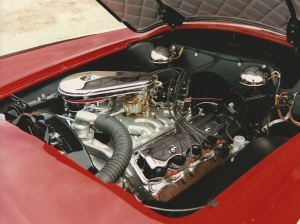 The only changes to the engine was chrome valve covers for show, and an off-set air cleaner to clear the low hood. After the show circuit, Virgil Exner was given the car, and it stayed with him until 1968. It changed hands a couple of times after that and Don William’s Blackhawk Collection bought and restored the car - painting it red. It was sold to Ele Cheney of New Jersey in 2001, while at Amelia Island. She claims to regularly drives the Belmont. This page was last modified on 25 September 2017, at 02:24.